The TetraCon® 325 condictivity probe is the result of WTWs commitment to quality and sets a new standard for professional conductivity measurements. In comparison with conventional measuring cells with 2 electrodes, the TetraCon® 325 conductivity probe offers numerous technical advantages. The Cond 3310 is a excellent instrument for all classical applications of mobile field measurement. It is designed for the collection of extended data series. A generous memory for 5000 GLP-compliant data together with a time-controlled data logger with adjustable intervals makes it unique for long term monitoring in field applications. A special sleep mode saves power when performing long term monitoring in order to extend the operating life of the batteries. And if it should happen in spite of this that power will break down: When supplying the instrument with a new battery it will pick up the data collection again. After sampling the data can be transferred over the unique waterproof mini-USB interface to a PC or Laptop. Typical Application: Professional mobile measurements everywhere where a demand for documentation and data transfer exists. Excellent double functionality of handheld and Data logger with extended memory in one instrument for example at pumping tests (ground water) in the field or temporarily monitoring of surface water etc. 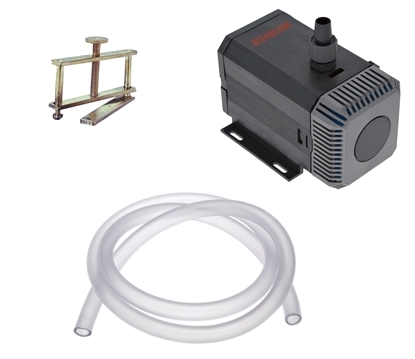 Use this accessory package for our AMP, DAQ and REG instruments to regulate water fluid.